We are Registered Osteopaths located in the Wiltshire towns of Devizes, Pewsey and Amesbury. Over 30,000 people every day visit an osteopath suffering from a variety of conditions including neck or back pain, joint or muscular pain, sports injuries, recurring headaches and more. Many patients are pregnant women and children, those suffering with work strain, or pain and stiffness related to advancing years. Osteopathic treatment is tailored towards the needs of the individual, rather than using a ‘one size fits all’ process. 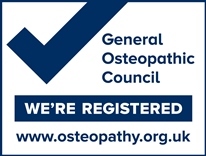 All Osteopaths must be registered with the General Osteopathic Council (GOsC), and I am also a member of the Institute of Osteopathy (iO). Both exist to raise standards of osteopathic care and improve understanding and awareness of the benefits of osteopathy amongst the public and fellow health professionals. The iO Patient Charter outlines the consistently high standards of service that all Osteopaths aspire to and what you can expect when you see a Registered Osteopath.